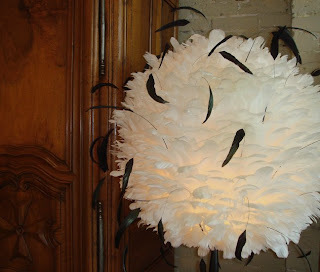 I've been seeing feather lamps around a lot lately. I haven't attempted it, but I'm thinking this could be a DIY project. You could just cover a plain shade or paper lantern. Attaching individual feathers would probably take forever, so I'm thinking feather boas instead. 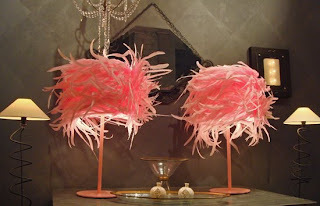 And for the record - I would like the second lamp much better if it was just white and didn't have those black feathers sticking out of it. BTW - anybody got a suggestion on the best way to dust these things? "And for the record - I would like the second lamp much better if it was just white and didn't have those black feathers sticking out of it." Ha Ha Britt! I totally walked right into that one, didn't I? You could try a can of compressed air. You can find compressed air at office supply stores. Maybe it'd ruffle the feathers too much though.